under Page 3 – News in Briefs, Rupert ‘The Evil One’ Murdoch. 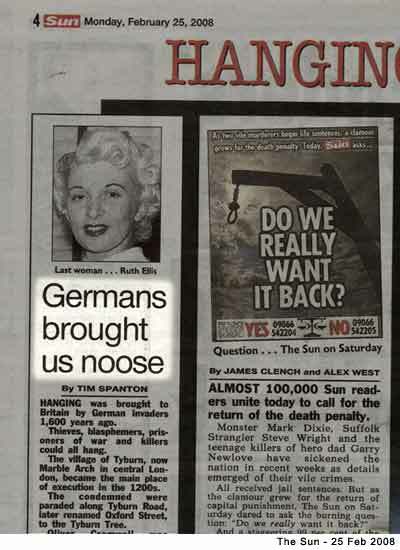 The Sun – Death penalty: Your verdict: Almost 100,000 Sun readers unite today to call for the return of the death penalty. Monster Mark Dixie, Suffolk Strangler Steve Wright and the teenage killers of hero dad Garry Newlove have sickened the nation in recent weeks as details emerged of their vile crimes. All received jail sentences. But as the clamour grew for the return of capital punishment, The Sun on Saturday dared to ask the burning question: “Do we really want it back?” And a staggering 99 per cent of the 95,000 readers who responded to our You The Jury poll said the Government SHOULD reintroduce it. OK, let’s start by generously accepting the following; every time the Sun runs a high-profile phone poll, roughly 100,000 of their 3 million readers vote (another e.g.). Let’s also classify this result as a 3% ‘voter turnout’ (rather than a vote involving 2,900,000 ‘undecideds’). 1. If the best The Sun can manage is a 3% turnout on a bloody phone-in poll, then I may have to start rethinking my position on compulsory ballot casting. 4. That same editorial also says; “(Capital punishment) will not be brought back on a wave of public emotion, however much we sympathise with it.” which isn’t entirely in keeping with Rebekah Wade’s position in past crusades for justice… but perhaps she’s starting to cotton on to this whole 3% turnout thing. 5. Of those readers who bothered to turn out for a phone poll, 99% of them are in such an emotional state that they are calling for a return to the death penalty, and some of them were even calling for a return to *public hanging* before the poll had started. In that case (and in most other cases not involving treason), the primary trigger/justification for bloodlust is the paedo-monster. 6. The kind of paedo-monster The Sun taunts its readers with all too often. 7. Lost control of the mob again, have we, Rebekah? 8. Rebekah Wade is so desperate to calm her readers, she’s even using her secret weapon, the Page 3 girl, and there’s some lovely spin on this boobtastic editorial; it’s because of the terrible things that we make you afraid of that we need a stronger alternative to the death penalty! Not only should we bring back hanging, we should also bring back the “Birch” for unruly thugs. Our prison are full of psychopathic killers who should have been executed years ago. Instead, it costs the taxpayers billions of pounds to keep these killers in a life of luxury for the rest of their miserable life’s. By bring back hanging we reduce over populated prisons, and save money that could go on hospitals, medical research etc. It’s about time politicians did their jobs, and started listening to the people they are supposed to represent. Forget the religious leaders, and the goody-goody brigade who are against hanging, and use common sense. If you deliberately kill someone you hang. If you steal, mug someone, burgle someones home, you get the Birch. This entry was posted in Page 3 - News in Briefs, Rupert 'The Evil One' Murdoch. Bookmark the permalink. 2 Responses to "Rebekah Wade offers a masterclass in mob control"
I was on Stephen Nolan last night on Radio 5 Live, between 10-11pm, you can listen again to the audio fireworks once a redneck taxi driver and lorry driver start hurling insults at me. I understand that EU member states can't employ the death penalty, and so this "clamour" for its reintroduction is pointless.